So, is there any good use of O/E analysis? Yes. It’s called Benchmark Opportunity Analysis. In last week’s post, I argued that observed over expected analysis (O/E) was commonly misused as a method for doing “level playing field” performance comparisons. I recommend against using it for that purpose. But, is there some other good use for O/E analysis? 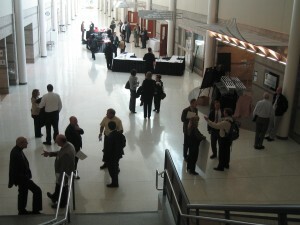 There are two main variations on the “opportunity analysis” theme. The first approach is to consider the overall average performance achieved by all providers as the goal. The basic idea is to estimate how much the outcome will improve for each provider if they focused on remediating their performance for each risk cell where they have historically performed worse than average. The analysis calculates the magnitude of improvement they would achieve if they were able to move their performance up to the level of mediocrity for such risk cells, while maintaining their current level of performance in any risk cells where they have historically performed at or above average. A good name for this might be “mediocrity opportunity analysis,” to emphasize the uninspiring premise. The second variation on this approach challenges providers to achieve excellence, rather than just mediocrity. I like to call this “benchmark opportunity analysis.” The idea is to create a model of the actual performance of the one or more providers that achieves the best overall performance, called the “benchmark providers.” Then, this benchmark performance model is applied to the actual population of each provider, to estimate the results that could be achieved, taking into account differences in the characteristics of the patient populations. These achievable benchmark results are compared to the actual performance observed. The difference is interpreted as the opportunity to improve outcomes by emulating the processes that produced the benchmark performance. As shown in this illustrative graphic, a benchmark opportunity analysis compares different improvement opportunities for the same provider. In the example, Acme Care Partners could achieve the greatest savings by focusing their efforts on improving the appropriateness of high tech radiology services. In contrast, Acme Care Partners is already achieving benchmark performance in appropriateness of low tech radiology services, and therefore has zero opportunity for savings from improving up to the benchmark level. That does not mean that they can’t improve. No analysis can predict the opportunity for true innovation. Benchmark opportunity analysis is just a tool for pointing out the largest opportunities for emulating peers that already perform well, taking into account the differences in the mix of patients between a provider organization and it’s high performing peers. This method is generally consistent with the “achievable benchmarks of care” (ABC) framework proposed more than 10 years ago by the Center for Outcomes and Effectiveness Research and Education at the University of Alabama at Birmingham. However, that group advises against using the method for financial performance measures, presumably out of fear that it could encourage inappropriate under-utilization. I consider that a valid concern. To reduce that risk, I advocate for a stronger test of “achievability” for cost and utilization performance measures. In the conventional ABC framework for quality measures, “achievability” is defined as the level of performance of the highest-performing set of providers that, together, deliver care to at least 10% of the overall population. Such a definition is preferable to simply setting the benchmark at the level of performance achieved by the single highest-performing provider because a single provider might have gotten lucky to achieve extremely favorable performance. When I apply the achievable benchmark concept to utilization or cost measures, I set the benchmark more conservatively than for quality measures. For such measures, I use 20% rather than 10% so as to avoid setting a standard that encourages extremely low utilization or cost that could represent inappropriate under-utilization. Note that one provider may have benchmark care processes that would achieve the best outcomes in a more typical population, but that same provider may have an unusual mix of patients that includes a large portion of patients for whom they don’t perform well, creating a large opportunity for improvement. The key point is that opportunity analysis is the right method to compare and prioritize alternative improvement initiatives for the same provider. But the results of opportunity analyses should not be used to compare the performance of providers. The following graphic summarizes the comparison of traditional risk adjustment, O/E analysis, and benchmark opportunity analysis. For those readers interested in a little more detail, the following table uses the same raw data from the calculations from last week’s post to illustrate the approach. 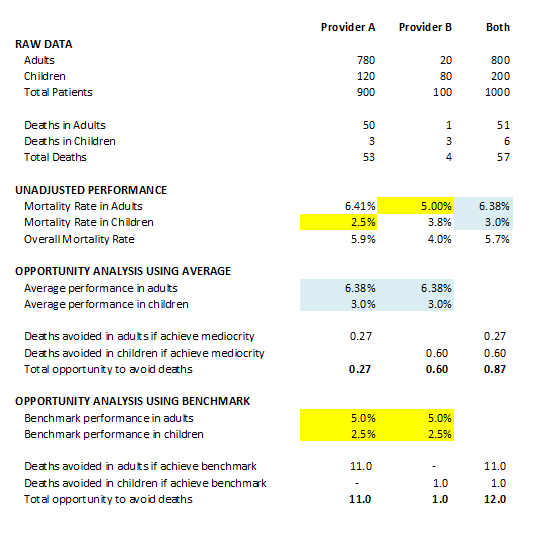 As shown in this example, Provider A has worse performance (higher mortality rate) than Provider B in adults. So, Provider B is the benchmark performer in the adult risk cell. If Provider A improved from 6.41% mortality down to the 5.00% mortality level of Provider B, it could save the lives of 11 adults per year. Provider B has worse performance in children. If Provider B improved its performance in children up to the level achieved by Provider A, while still achieving its benchmark level of performance in adults, it could save 1 life per year. Observed over expected (O/E) analysis is commonly misapplied to performance comparisons. Please don’t. A few years ago, I had a shocking and enlightening discussion about analytic methods with a group of epidemiologists and biostatisticians from Blue Cross Blue Shield of Michigan. When epidemiologists want to compare the performance of two health care providers on a level playing field, the traditional method is to do risk adjustment using an approach called standardization. The concept is to determine which patient or environmental variables influence the outcome of interest. These are called confounding variables, because differences in the mix of patients based on these variables can confound the performance comparison unless they are taken into consideration. Examples of such confounding variables include age, gender, the presence of co-morbid conditions, etc. If any of the confounding variables are continuous numbers, like age, the epidemiologist must first convert them to discrete categories, or groupings. For example, if age was the confounding variable, the epidemiologist might define categories for “adults” and “children.” Or, the epidemiologist might break age into ten-year ranges. If there is more than one confounding variable, the categories are defined based on the combinations of values, such as “adult females,” “adult males,” etc. These categories are sometimes called “risk strata” or “risk cells.” Then, for each of these categories, for each of the providers being compared, the epidemiologist calculates the outcome measure of interest, such as the mortality rate or the total cost of care. The result is a matrix of measure values for each of the risk cells for each provider. This matrix can be conceptualized as a “model” of the actual performance of each provider. To create a level playing field for comparisons, the epidemiologist then creates a standardized population. The standardized population is simply the number or percentage of patients in each of the risk cells. Then, the model of each provider’s performance is applied to that standardized population to determine what the outcomes would have been if that provider had cared for the standardized mix of patients. For each of the risk cells, the standardized number of patients is multiplied by the actual performance that provider achieved for such patients. Then, the results for all the risk cells are aggregated to obtain that provider’s risk-adjusted performance. Another way of thinking about this is that the risk adjusted outcome is the weighted average outcome for all the risk cells, where the weights are the proportion of patients in that risk cell in the standardized, level-playing-field population. If the provider’s actual mix of patients was “sicker” or “higher risk” than the standardized population, then the risk adjusted outcome will be more favorable than the unadjusted outcome. In the literature, even in respected journals, I have seen many examples of performance comparisons that used a different analytic approach called “observed over expected” or “O/E,” rather than using the traditional standardization approach. 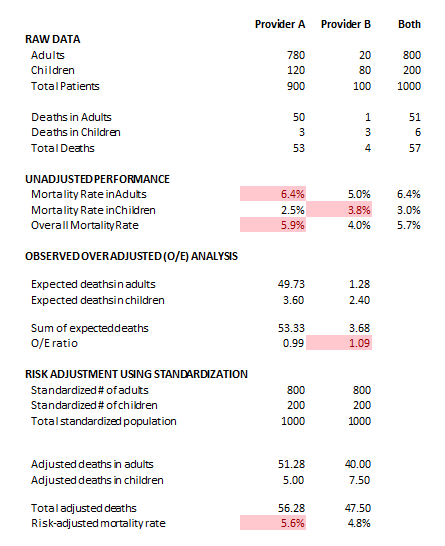 A recent example is a paper regarding the mortality-avoidance performance of childrens’ hospitals. Just as with standardization, the O/E method begins by identifying confounding variables — the patient characteristics that are predictors of the outcome of interest. With O/E analysis, confounding variables that are continuous, like age, do not have to be converted to discrete categories or groupings. All the confounding variables are used as independent variables in a regression model. Then, the resulting regression model is applied to each individual patient observation, inserting the values of the predictor variables for that patient into the regression formula to obtain the “expected” value of the outcome of interest. At that point, you have the actual observed value and the expected value for each patient (or case). Then, you sum up the observed values for all the patients for a given provider. And, you sum up the expected values for all the patients for a given provider. Finally, you divide the sum of observed values by the sum of expected values to get the O/E ratio. If the ratio is greater than one, that is interpreted to mean that the provider has a higher-than-expected value for that outcome. If the outcome variable is undesirable, such as mortality rate, complication rate or cost, an O/E ratio of greater than one is interpreted to mean that the provider performed poorly compared to the other providers. People have been routinely using O/E analysis as if it was a way of doing risk-adjusted performance comparisons — as a way of “leveling the playing field” to do performance comparisons that take into account differences in patient characteristics. But, sitting around the table in Lansing, I was shocked to realize that O/E analysis is not actually applicable for this purpose. Why? Because O/E analysis does not actually create a level playing field. On the contrary, O/E analysis is conceptually the opposite of the traditional standardization approach. 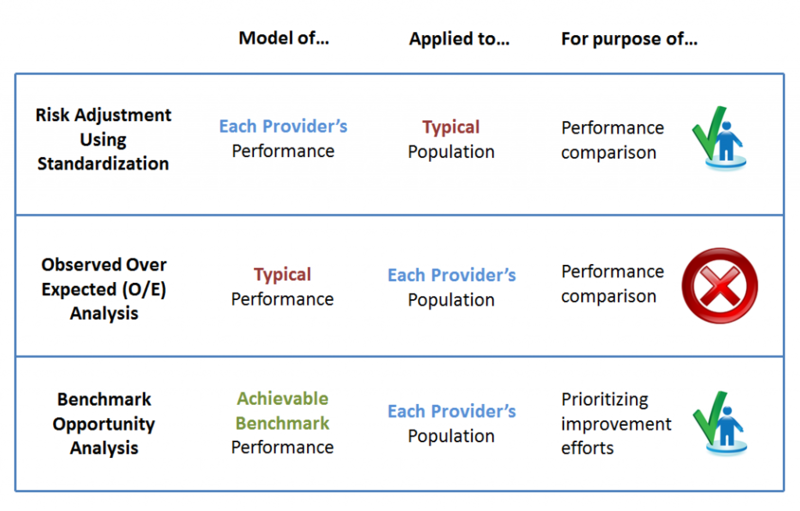 In traditional standardization, a model of each provider’s actual performance is applied to a standardized population. In O/E analysis, the regression model is essentially a model of typical performance. That regression model is applied to the actual population that received care from a particular provider. The problem is that different providers can see a different mix of patients. Consider the following simple calculations. In this simple example, we are comparing just two providers. We are considering just one confounding variable, age. And, we are breaking that variable into just two categories, adults and children. As shown in the example, provider A sees mostly adults, while provider B sees mostly children. Provider B performs poorly in those children, but actually performs better that A in the adult population. Because provider B sees more children, the poor performance in children dominates the O/E calculation, so provider B looks bad in terms of an O/E ratio of 1.09. But, since there are more adults than children in the overall population, which we are using as the “standardized” population, provider B’s superior performance in adults dominates the risk adjustment. So, provider B has a risk-adjusted mortality rate that is better than provider A. In other words, if you use O/E analysis for level-playing-field performance comparisons, you may get the wrong answer. Risk adjustment using standardization is not computationally difficult. But, it does require a bit of programming work to convert continuous variables such as age into categorical variables, such as breaking age into ten-year ranges. In my opinion, O/E analysis should not be used for risk-adjusted performance comparisons. O/E analysis does have the advantage of being computationally more convenient, particularly when you have many confounding variables and when some of them are continuous variables. But, it is not that much more work to do it right. Accountable Care Organizations (ACOs) involve the creation of new entities that are intended to improve quality and efficiency of care. But, experts in economics and anti-trust law worry that ACOs can have the unintended effect of reducing competition among health care providers, creating local monopolies that can drive up prices. In a recent commentary in the Journal of the American Medical Association (JAMA), Duke faculty members Barak Richman, JD, PhD and Kevin Schulman, MD argue that providers forming ACOs are emphasizing horizontal integration of formerly-competing entities to increase market power and generate monopoly profits in the privately-insured health care market, rather than focusing on vertical integration of complementary entities to generate performance-driven savings in the publically-insured Medicare market. They explain that monopolies are even more problematic in the health care market than in other markets because private health insurers insulate consumers from directly facing unreasonable monopoly prices, hiding those high prices behind increasing insurance premiums. I would argue that such prices are even more obscured from consumers when they take the form of slower salary growth offered by employers shifting compensation dollars to cover increasing health insurance costs. Health plans face regulations and other barriers that limit their ability to refuse to pay these higher prices, even if the price exceeds the value received by their members. The Patient Protection and Affordable Care Act of 2010 (PPACA), the health care reform law that features ACO gain sharing provisions for Medicare, does not exempt health care providers from anti-trust laws or oversight by the government authorities responsible for enforcing those laws. As explained in a recent article in the New York Times, two government authorities share anti-trust enforcement responsibilities: the Federal Trade Commission (FTC) and the Justice Department. In recent years, the FTC has taken the lead in reviewing proposed joint ventures of hospitals and physician organizations to examine whether the benefit to consumers from efficiency gains exceed the harms to market competition. The FTC has expressed concerns about the potential anti-competitive effects of ACOs, and is thought to be less empathetic to ACO’s arguments about the value of ACOs to achieve care process transformation and associated quality and efficiency gains. The Justice Department, in contrast, is thought to be more enthusiastic about ACOs and more vested in the success of ACOs and the PPACA in general. The two government entities appear to be engaged in a debate about turf and approach. What can the government do to avoid health care monopolies without inhibiting health care transformation? First, the government can clearly communicate standards, processes, and the responsibilities of the government entities involved, including the FTC, the Justice Department, and CMS. Apparently, the agencies are working to create such a document, but the debates have delayed its completion and release. Second, the government can make sure that the process is expeditious and not overly burdensome on health care providers. The FTC’s reviews of joint ventures of hospitals and physician organizations have historically taken a year and required expensive analysis and documentation. These reviews need to be streamlined. In addition to federal anti-trust oversight, states have the option of implementing price controls to curb excessive monopoly pricing. According to Richman and Schulman, some states were successful in using rate caps during the 1970s and 1980s. But, such anti-market approaches are likely to be politically unpalatable, and should be reserved for the scenario where other oversight approaches fail, or for rural areas where small population density cannot support multiple competing ACOs. What can ACOs do to steer clear of anti-trust issues? I’m no lawyer, so the following is clearly not legal advice. But, in my opinion, ACOs should be centered around primary care physicians and the defined populations of patients with whom they have care relationships. And, they should have a sincere primary focus on making investments in patient-centered care process transformation that are obviously beneficial to “consumers.” If ACOs are centered around hospital facilities, and if they lack credibility in the investments they are making in care coordination, disease management, quality improvement and other care process improvement initiatives, anti-trust enforcement officials are going to be less likely to conclude that the efficiency gains exceed the harms to market competition. Second, be leary of ACO structures that involve 100% of the providers or facilities of any type in a local market, particularly in markets that have a large enough population to support competing providers. Finally, and most importantly, get quantitative about quality and efficiency benefits. Be ready in advance of launching an ACO with prospective models, based on explicitly stated, reasonable assumptions, showing that the investments and process changes that are planned can plausibly be expected to achieve substantial improvements in quality and reductions in cost compared to trend. Then, be ready with the database, epidemiology expertise and analytics to support population-based, risk-adjusted metrics to prove that the planned quality and efficiency gains are actually being achieved in the expected time frame. Those prospective models and retrospective evaluations should apply not only to the Medicare population, but also to privately insured and uninsured populations. Nothing is likely to be as convincing to anti-trust enforcers than valid measures of quality and efficiency benefits that accrue to consumers.